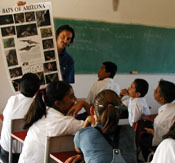 We developed bilingual educational materials, demonstrated these materials at schools in Arizona and Mexico, and conducted teacher-training workshops on Migratory Pollinators. These materials include information on pollination biology, migratory routes, conservation and threats, and the importance/value of pollinators. We are currently developing a migratory pollinators board game that will be distributed to schools. 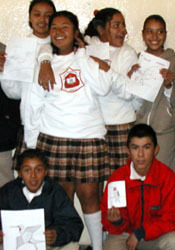 We targeted our education outreach strategies to local audiences (schools, community centers, and civic leadership groups) in southern Arizona and western Mexico. Pollinator gardens have been planted at schools in Arizona and Sonora, and we recently received funding to develop a pollinator garden at Tumacacori National Historical Park and in San L�zaro, Sonora, Mexico. Schools, business owners, and other local residents were also recruited to collect data for the Migratory Pollinator Program. The participatory approach of the Education Outreach Program allows local people to take control of their own resources through understanding, information gathering, and subsequent management action. Local knowledge of pollinator species can also be validated, used, and celebrated in the service of conservation efforts. The program has encouraged local citizens to become empowered to protect and promote pollinators in their region. The process of pollination and the diversity of beneficial animals involved in providing services to plants are still poorly understood by the American public. For most Americans, pollen means allergies and bees mean stings. The basics of pollination biology (e.g. migratory pollinator natural history and biology, plant/pollinator interactions, nectar corridors, and pollination services that benefit society) have been virtually absent from Arizona and Mexico school curricula and community education agendas. 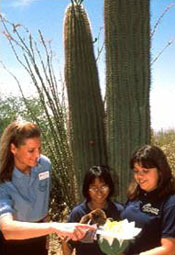 In order to effectively implement long term conservation strategies that can contribute to the survival and health of ecological communities in the Sonoran Desert Region it is crucial that we educate and involve the public. 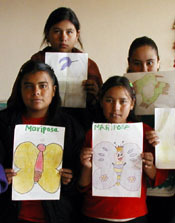 The Binational Education Outreach Project has been a fundamental and integral element in the Migratory Pollinator Program, providing educational materials and training to schools and the general public in both southern Arizona and in western Mexico (Sonora, Sinaloa, Jalisco). We identified conservation and education gaps in areas throughout the migratory region to determine which sites needed the most protection to maintain the integrity and function of the nectar corridors for the key pollinator species. 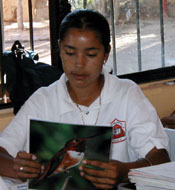 The education outreach team provided direct education and introduced locally sponsored research projects in communities along migratory routes. An audience of teachers, students, ecotourist groups, and Native communities were targeted along these corridors for science based education efforts. Our goal was to promote public awareness of migratory pollinator issues, encourage local citizens to become empowered to protect and promote pollinators and their floral resources, and evaluate how existing local knowledge of pollinator species can be validated, used, and celebrated in the service of conservation efforts. Pollination brochures with information on pollination biology, key pollinators and plant species, migratory routes and habitats, and conservation. Four Pollinator Poem Posters featuring the work of MacArthur Award winning Native American poet Ofelia Zepeda. The poems about each of the four pollinators (lesser long-nosed bats, rufous hummingbirds, white-winged doves, and monarch butterflies) were presented in English, Spanish, and O'odham, the indigenous language dominating much of the binational corridor. 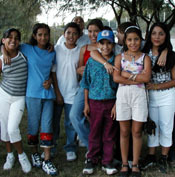 Educational packages that include information on the natural history of the Sonoran region, migratory birds, pollinators and key plant resources, conservation and threats, hands on activities for schools, and pollinator stories. 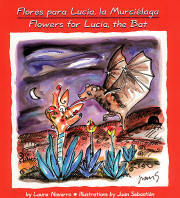 Flowers for Lucia/Flores para Lucia, a bilingual children's book. Field guides and maps for identification of pollinators, plants, and migratory routes. Hummingbird feeders, sugar, and information on feeder maintenance. Data collection forms used to collect scientific data on the key pollinators and their floral resources for the Migratory Pollinator Program. Pollinator garden brochures, information packets, and a Desert Pollinator Garden Kit. Migratory pollinators board game (in development).